Eric Thake served as an official War Artist from 1944-46 in Australia and the Pacific, when for the first time he was able to work full time as an artist. He faced few restrictions in his choice of subject in his drawings, watercolours and paintings of everyday life and military operations. 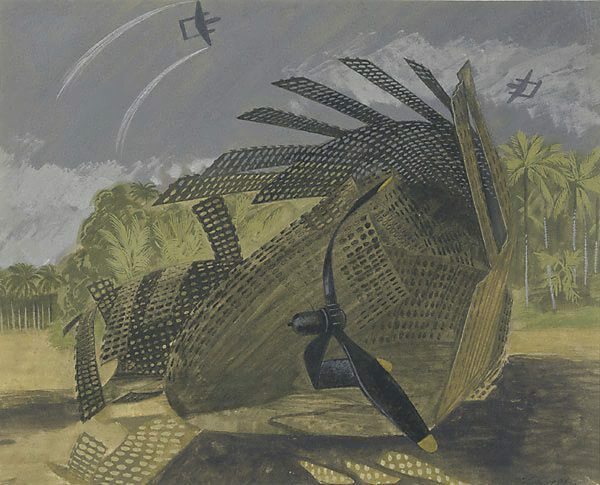 Thake's satirical approach to his subject is revealed in the title – the 'birds of paradise' are aircraft buzzing the disintegrating remains of a wrecked aeroplane beached on a tropical shore. The surrealist sensibility of his imagery is underscored by an emphasis on an apparently weightless metal propeller, suspended in the centre of the composition and counterpointed against an idyllic landscape. This disjunction can be seen as a comment upon the chaos and devastation of warfare, whilst the inherent strangeness of the wreck provides a metaphor of simultaneous human creativity and destructiveness. Signed and dated l.r. corner, "Eric Thake 1945". Martin Terry, Arts National , 'The Australian landscape tradition in watercolour', pg. 22-27, Hamilton, Nov 1985-Dec 1985, 25 (colour illus. ), 26.